My kid never has carrot, when I give him he just throws it. So I make this plain paratha by just adding carrots. When preparing for kids you can skip adding green chilli / red chilli powder or add very little amount. We can also add a bit of curd and cream to the flour while kneading , it makes parathas smooth. I made this paratha while preparing Tiranga paratha which I am yet to upload for independence day :) This can be served along with curd / pickle. Hope you like it, lets go through the procedure. 1. Wash the carrots and grate them. 2. In a mixing bowl add wheat flour, grated carrots, curd, salt, green chilli, chopped coriander and knead this to smooth dough by adding little water at a time. Add oil so that the dough becomes smooth. 3. Allow this to set for 10- 15 mins. 4. Take small round balls of dough and spread it like chapati. 5. 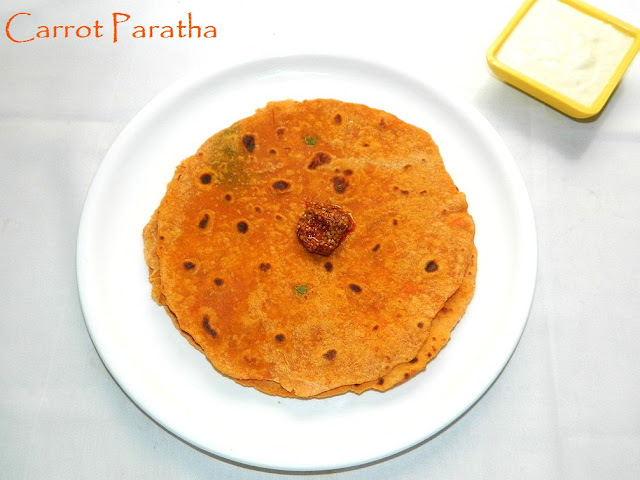 Heat frying pan, sprinkle little oil and toast the spread parathas.